Cyrus Pinkham Collection, Northeast Historic Film. 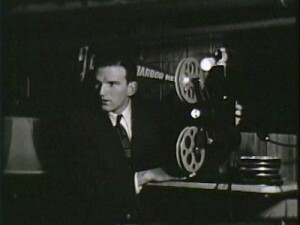 Cyrus Pinkham at his 16 mm. projector. Cyrus Pinkham is discussed by Christopher Castiglia & Christopher Reed in “Not at Home Movies,” Martha J. McNamara and Karan Sheldon (eds. ), Amateur Movie Making: Aesthetics of the Everyday in New England Film, 1915-1960, 2017.